I was asked to give some general advise to some high school students who were interested in event photography for a local newspaper. Besides the expectation of exposure and composition, submissions to the paper must be accompanied with a caption that includes the normal What, Where, When and Who, but also an explanation of why the photograph is linked to the event. Photos of this type are often of people receiving awards, performing charitable work, or enjoying some local event. This sample photo was not submitted because I could not get the participant's name before the submission deadline. However, for this sample a title of "three students" will suffice. The City of Millbrae’s Japanese Culture Festival Committee and The Millbrae Chamber of Commerce sponsored the 7th Annual Japanese Culture Festival on Sunday. The first sentence establishes the What (Japanese Culture Festival), the Where (Millbrae), the When (Sunday, two days prior to date of publication). 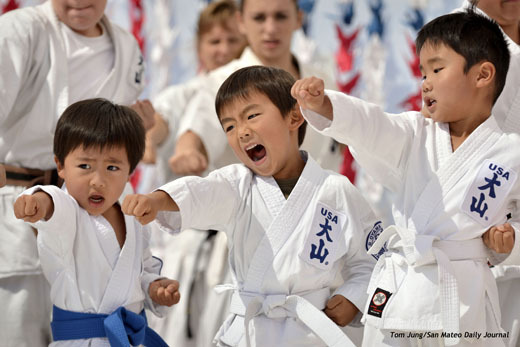 Here three students show their martial arts skills during a demonstration by the World Oyama Karate, a martial arts school focusing on strengthening the mind, body, and spirit through hard, intense training. The second sentence provides the Who (three students) and the link to the event (demonstration by World Oyama Karate). The information about the school came directly from the World Oyama Website. I will often add information about any charitable organization that I copy from their website mission statement. 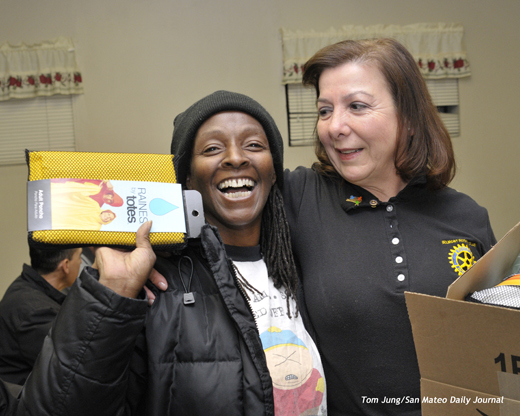 Gloria Thompson-Edge, left, receives a new poncho from Lily Laurent Ryan at the Westside Church of Christ in San Mateo on December 7 (2011). The church dining room serves hot meals weekday evenings from 5-6 pm with the support of the Samaritan House. The ponchos were donated and distributed by members of the Belmont Rotary Club. This caption follows the same formula, but in this case I chose to identify the two women in the first sentence, followed immediately by the where and the when. The Why can be inferred by second sentence, while the third gives some additional information about the donors. Getting Names: Obviously this shot couldn't run without the names. When approaching people, I remember one piece of advice my Father gave me many years ago: Don't photograph anyone who doesn't want to be photographed. But these are not "hard news" assignments where personal privacy is trumped by "information for the better good". Instead, I was in the basement of a church serving hot meals to the community. There could be a number of reasons why Gloria would not want her photo published. To get this shot, I came right out an introduced myself as a photographer for the Journal, and that she had a really great smile, and that I would like to make a photography of her, standing with Lily, so I could show what great work the Belmont Rotary Club was doing. She was very accommodating and the two of them fell into the pose you see. I tried my best to be sure that nobody else was in the photo, but the best I could do was partially obscure the lone diner in the background. 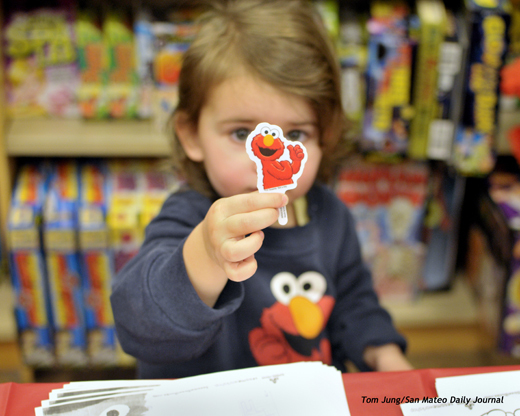 The Barnes and Noble at Hillsdale hosted a birthday party for Sesame Street’s Elmo on February 3 (2012). The party featured a special book reading, games, crafts, and cake. Here, 2 year old Lina Bozic holds up her new finger puppet. Elmo first appeared on Sesame Street in 1983. Perhaps to show that order isn't everything, I wrote this caption for an Elmo Birthday Party. As soon as I saw this young lady, I knew that this was the photograph. Because of the age of the child, I needed to be absolutely sure that I had permission to publish the photo. I introduced myself to the young woman who accompanied her, who turned out to be her baby sitter. In order to get permission, I had the sitter call the mother, explain the situation, and told her that I would e-mail her a copy of the image for her approval if she would call me, which she eventually did. When she saw the photo, she gave her approval to publish. This was probably the longest quest I ever made to get permission, but felt it was the right thing to do. It is the caption that pulls the photo together, giving the photo an intellectual context that will shape our response to the photo.